Having come to Tucson from a very large metropolis, and after years of living in the Foothills, we yearned for a bit of hustle and bustle—but not too much. We also sought quiet, privacy, and safety. We found all that we wanted in Armory Park del Sol (APdS), where we are just beginning our sixth year. As owners of one of the purpose-built “zero energy” homes, we enjoy incredibly low electricity expenses—approximately $150 for an entire year, a sum that includes only service charges and taxes. We are pleased to live in a development that promotes resource conservation and close attention to supporting our environment. Our APdS house is a well-constructed, quiet, comfortable home where great care has been to assure a high degree of livability. Heating, ventilation, and air conditioning systems have been reliable and operate in near silence. External noise is hardly noticeable. We and our APdS neighbors enjoy several benefits. 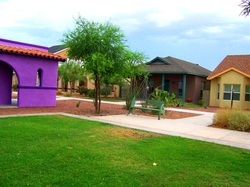 We have modern solar homes within the charm of Armory Park, one of Tucson’s oldest historic neighborhoods. We can keep our cars off the street, inside locked garages, a rarity in the city of Tucson, as opposed to the suburbs. But we don’t always have to use our cars. Living downtown brings us within easy walking distance of major city attractions. The new streetcar service connects us to many of these facilities, as well as to the University of Arizona campus and its medical center. The APdS layout, designed expressly to promote easy pedestrian, stroller, and wheelchair movement, brings residents together as we walk our dogs, pick up our mail, or merely saunter about for fresh air or visits with neighbors. All the homes are accessible to the disabled. Last but not least is the sense of community at APdS. The residents are a friendly group of house proud people who support one another and have formed several committees and interest groups organized for mutual benefit. We have the best of everything at APdS and applaud John Wesley Miller’s foresight and lifetime efforts to “seek the unique” in housing. Don't see what you want on the list? Give us a call & we'll add it on!